Portsmouth magician and mind reader Edward Crawford, has been amazing audiences in Portsmouth and throughout the UK, with his unique style of psychological illusion, and incredible ability to read minds, for over fifteen years. With acts including a close up performance (magic performed to individuals and small groups, either sat at a table or standing as Edward mingles amongst your guests), a parlour show (which combines Edward’s close up act and stage show, perfect for smaller audiences), and stage show (ideal for bigger audiences and venues), Edward has the perfect performance for every type of event and function. Whether you’re planning a corporate event, ball, wedding, banquet, charity gala, or private party, Edward has a performance to suit your event and will leave your guests with the most memorable experience. Over the years Edward has developed his contemporary and grown up style of magic by combining psychological illusion with magical trickery and sleight of hand, and a dash of humour. Your guests will witness Edward reading their thoughts, predicting the future, and moving things with just the power of his mind. In recent performances guests have witnessed Edward driving blindfolded, predicting the headlines on a national newspaper weeks in advance, replicating the drawings of a guest in a separate room, and playing Russian Roulette (his family and friends are still recovering from this!!)! Edward’s act will leave even the most cynical guest amazed and thoroughly entertained. 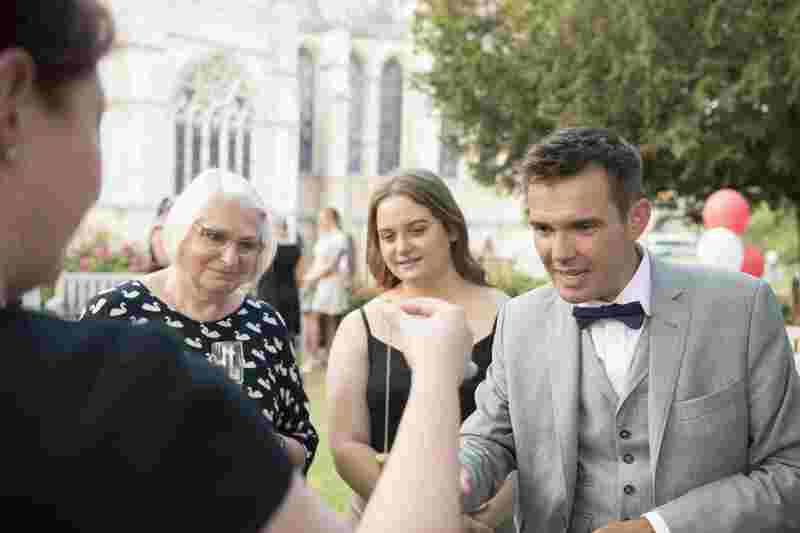 If you’re after a Portsmouth Magician Edward will have an act to suit your event. No matter what event you’re planning Edward will tailor his act to suit you and your needs, and you can rest easy with the knowledge that your event will have the very best entertainment, from a full time professional with over 15 years experience in his field. To hire a Portsmouth magician contact Edward on 07814 135569 or info@edwardcrawford.co.uk for more details. If you would like to book a Portsmouth Magician simply fill in the enquiry form below. Edward demonstrated his professionalism from the start. He listened very carefully our expectations and tailored his show based on the intent of the event, time we had and the nature of audience. He arrived earlier than he should to complete his preparations and familiarize himself with the audience. All our guests at our corporate Christmas lunch were so amazed with Edwards show. He has this great ability to get immediate attention of all the guests (ours was a multi cultural event with wide range of different backgrounds and ages) and keep them engaged throughout the show. After the show so many guests approached me to share their admiration to him. Personally I was really amazed with his mind reading ability and knowing the unexpected. We will definitely consider him for our future events and I can recommend him with no hesitation. The following is taken from the blog on my previous website. Over the forthcoming months I will attempt to transfer all the entries onto this site but for the time being hopefully this will give some idea of past bookings. On Saturday afternoon I was hired to perform close up table magic at a wedding reception at HMS Nelson Wardroom in Portsmouth. The people who booked me for this event had seen me perform my parlour show at an an event earlier in the year and had contacted me a few weeks later to book me for this event. The wedding reception was a very informal, intimate affair – an afternoon tea with about 50 guests. I was hired to perform for 2 hours. The reception was a very relaxed, informal affair which is always one of my favourite type of events to perform close up. I arrived at the venue half an hour early to prepare and after saying hello to the people who had booked me I spent some time observing the guests, trying to work out who would be the best people to use in various routines. It always helps me out to get an idea of my audience before I perform, I’m looking for people who are shy and retiring and those who are the complete opposite, the outgoing, life of the party type. I will use both types in a number of routines but certain things work better with certain people. When I was ready to go I started to mix and mingle with the guests at their tables. My favourite thing about working close up for smaller groups is that I get a real opportunity to get to know people. I could spend 10 to 15 minutes with each table giving them a really in depth performance and including everyone at the tables in the various routines. Due to the psychological nature of my mind magic I would generally start off with a warm up which would include everyone at the table, this would give me an indication as to who would be the best people for the more in depth routines. My favourite warm up involves a prediction, a typical example is that I would write something down in a piece of paper. I would then ask the table to decide amongst themselves the name of a playing card. Which ever card they decide upon would be found to have been written down on the piece of paper! With the warm up out of the way I would move into the mind reading, at this point I will try to read the minds of the 3 or 4 people at a time. I might ask them to think of names of old friends, dates of important events and draw pictures which I will attempt to reproduce. Very pleased to say I had an almost 100% hit rate throughout the afternoon. Once I’d been round everyone once I went back to tables and performed a few additional routines, these are some of my absolute favourites which I rarely get the chance to perform when working close up due to time restraints. If you ever see me perform do ask to see my empathy routine. It’s one that always results in gasps of astonishment. I had a fabulous time performing for everyone and was very pleased to receive another booking for later in the year from one of the guests. If you’re after a Portsmouth magician for your event please get in touch to discuss details.